MCOMS is a leading guest-facing solution provider for the hospitality, cruise ship, and healthcare with regional offices in Europe, North America, Middle East, Africa and Asia-Pacific and a worldwide network of partners. MCOMS designs, develops and operates advanced IPTV, VOD, Mobile, Cast and Signage solutions for Smart TVs, set-top boxes, smartphones, tablets and digital signage monitors. 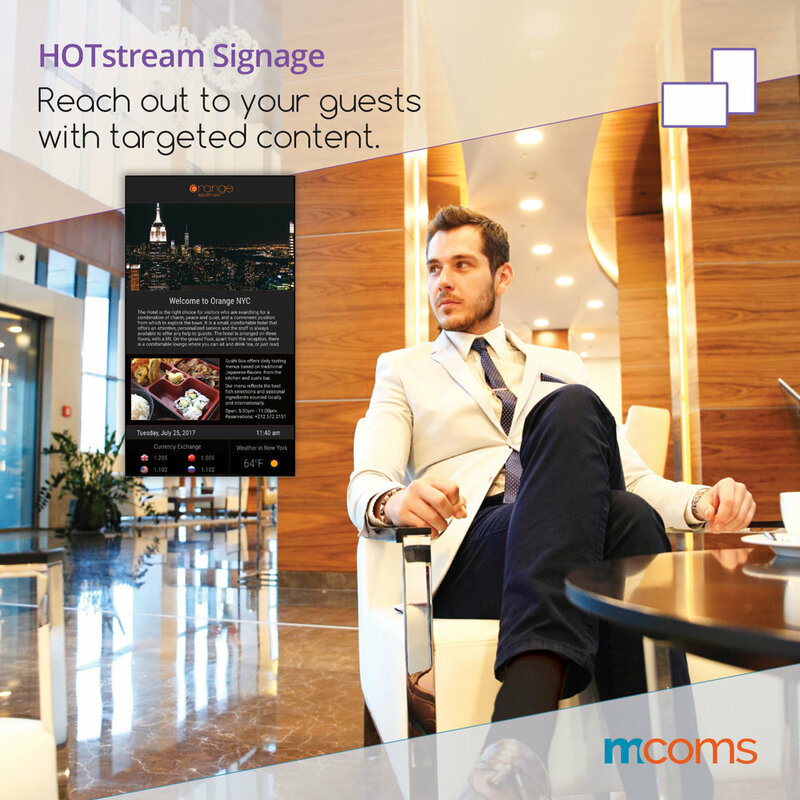 MCOMS HOTstream suite delivers digital content, connectivity, and commerce services to hotel guests and travelers on multiple devices via ONE centralized platform! Our IPTV, VOD, Mobile, Cast and Digital Signage platforms are completely integrated and commerce ready for hotel guests. HOTstream has already been installed in more than 40.000 rooms and cabins worldwide by working closely with major hotel brands and luxury boutique hotel chains. MCOMS’ technical expertise has resulted in a highly customizable luxury product that brings to life each property's unique vision of hospitality. Among the Boutique brands that MCOMS services are The Public, Viceroy, The Standard, Soho House, Como, Nomad, Freehand, Shinola, Acqualina, The Setai, The Betsy and more. Check out their social posts too! mcoms will be hosting a pop-up booth at The Stay Boutique Village!